← This is the New Year! I woke up this AM and found a post from a family friend that she shared about saving money for a year. 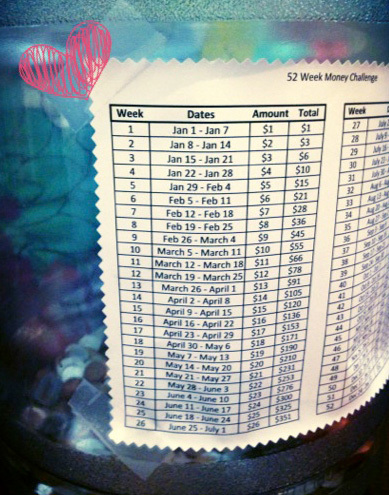 It’s a 52 week money saving challenge, and by the end of the year you should have saved $1378. This year will introduce new challenges for my family, as we are one income smaller and will be one child larger by May…so I’m thinking I’ll give this a try! You can find all the spreadsheets you need here, and they even have a fun one for kids with quarters! Here’s my jug! I hope I can fill it up! What would you spend the money on? This sounds like so much fun and so easy! I’ll have to try it out! I’ve seen that! Such a great idea. We put away a significant amount every month into savings and it’s nice knowing we have that extra cushion. I think that if I’d worked that hard to save it all year, I’d put it into an investment at the end of the year. That’s a great idea! I’ve never been very good at investing…but the hubby is!